Saw this on Marcia Attamilgad in NRo on 12/3/18 for 35 nobles. This item has a graphicless look. The effect is a 300pt rune buff with a 5 to all saves buff, and costs a cats eye agate to use =/ Still nice to have ) Great hat! There is no effect on this - just FYI. 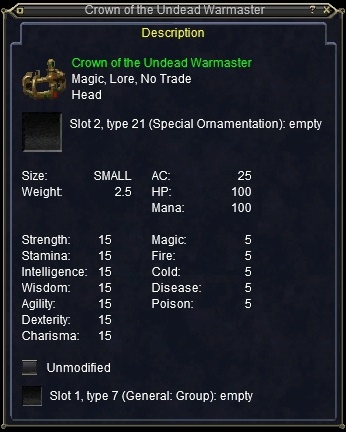 this is one of the nicest head pieces in the game as far as obtaining it.. stuff like this comes from tov only usually and deep inside it .. but u can raid acrylia with guild alot easier then running all the way through tov lol.. nice item! what does this helm look like when worn? Ring of Fire can be faught all the way through wave 5 with only 24 people. It isn't easy however, 5-6 clerics would be ideal and 5th round has been known to wipe out 46 person raid party of a respectable guild on my sever. Too many people can make things worse, making it too crowded for the amount of space in the room. If your a class without alot of ac and hps, its best you stay as close to wall as possible or you might not escape agro. It helps if you shrink everyone including the people who insist they dont want shrink because they hate it. Nope, RoF has a repop time..needs about 18 hrs between triggers IIRC. useless item doesn't proc anything. hehe but really though is their a better head item for the paladin class? just wondering, I'm not saying its a paladin item or anything just wondering whats the best if this isn't. i personally have passed on SS helm cause this one is just way better. in fact if this dropped for my guilds raids i would definatly roll on it. makes for a decent raid helm seeing as its got more stats plus 3 more to resist all. and being a 55 SK i dont take much dmg from mobs melee so the ac loss would be inconcequential compared to the resist gains. "useless item doesn't proc anything." Any drop information would be nice. I'm sure it's on a boss mob in Acrylia Caverns or something. But the name and drop information would be helpful. Once you get to the 5th boss you will have been through about 90-120 minutes of always fighting mobs (cos you have to) and when he comes he will cut you down in a few seconds if you arent prepared.